Grand Theft Auto is about to invade Nintendo's kid-friendly system and we couldn't be happier. Grand Theft Auto has run amok on PSP, but aside from GBA, Nintendo's systems got the shaft. That changes next month when Rockstar Games ships the much-anticipated Grand Theft Auto: Chinatown Wars for Nintendo DS, introducing a new sub-chapter that takes place in the heart of Liberty City. Get ready for more vehicular mayhem and shoot-em-up action, because Wars brings it by the boatload. In the game, you control a spoiled up-and-comer named Huang Lee. His father, a former syndicate boss, was killed following a power struggle with a rival gang. He's then given the task of returning to Liberty City with a prized family heirloom, the Yu Jian sword, to give to his uncle, Wu "Kenny" Lee. Upon arriving at the airport, however, he gets ambushed by members of the rival gang that steal the sword and leave him for dead. Later, Kenny informs him that the sword is actually a gift for another mob boss, one that could put him in a greater seat of power than Huang's father. Like previous GTA games, Chinatown Wars gives you an apartment that works as your home base. Here you can save your game, look over jobs that need to be done throughout Liberty City, keep drugs to restore health and stay in touch with loyal contacts. All of these become pivotal in your quest for the sword, a goal you reach by completing various missions. Wars will also have a Social Club aspect, where you provide stats and trade items with your friends through the Nintendo Wi-Fi Connection. 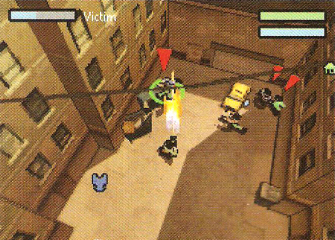 Chinatown Wars utilizes a top-down perspective, similar to early Grand Theft Auto games but with a little more detail. Here, you're able to shanghai cars (via carjacking), get involved in shootouts and perform other heinous acts while keeping an eye on everything that surrounds you. A bright yellow arrow highlights the direction you need to go, and changes automatically if you miss a pivotal turn. In case you need it, an in-game GPS is also available, showing you objectives and other locales throughout Liberty City. The graphics look good thus far, and the final release will also feature various radio stations, so you'll find music to your liking. 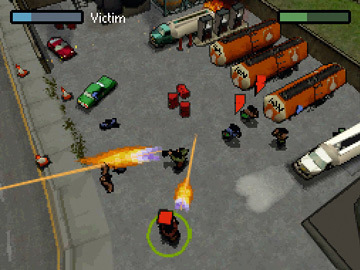 Whether you're on-foot shooting enemies or peeling around town in an SUV, Chinatown Wars is custom built for DS owners. You'll have no problem getting into the game's custom set-up, although there are some challenges to overcome. For instance, when the cops give chase, you actually have to get them to crash to decrease your star rating, forcing the fuzz into a head-on collision with an oncoming vehicle or ramming them off the road, Burnout style. Throughout the adventure, you'll deal with a variety of seedy characters. Some lend you a hand, such as Kenny or his loyal buddies, but others need to be closely watched. You'll run into an assortment of crooked cops, rival gang members and crime lords eager to wipe the floor with you. Who you associate with plays a huge part in the game, as you'll need to make a steady income through drug sales. Cross someone and you'll have to take care of them. It's about time Grand Theft Auto got an original release for the DS and we can't wait to plow through pedestrians. Be sure to check back next month for the final verdict.